From archaeological adventures on land to expert led gulet cruises and private charters, we like to think we offer the very finest cultural tours and holidays – but we are always trying to improve. Our clients come from very different walks of life and age groups. We’re delighted that many come back to travel on our escorted historical tours and small group cruises again and again. We feel that their testimonials describe who we are and what we do far better than we ever could. Here’s a small selection. We had the most remarkable family tour with Peter Sommer Travels. Not only everything was perfect, but we felt, in every instance, that our guides and our gulet crew truly cared about us, both the kids and adults, and did their best to make this trip memorable. For our well-traveled children (aged 9 and 6) this definitely has become the most eye-opening, adventurous, and stunning journey of their life - something they will remember, draw upon, and cherish for many years to come. For adults, we were pleasantly surprised by the diversity of our trip: from neolithic archaeological sites to medieval castles, from swimming to get obsidian to talks on board of our wonderful gulet, from ever-changing and filled with surprises meals offered on board to culinary experiences on the shore, every island and every new activity offered new experiences. We definitely will be back! Our gulet cruise from Kos to Patmos was everything and more than expected. It lived up to the Peter Sommer Travels' emphasis on culture, history, archaeology, comfort and camaraderie. Exceptional guides attended to each guest's interests and needs and were exceptional hosts. Very enjoyable were swimming in secluded bays, the wonderful food quality and selection and the sites visited on each island. It was all one could hope for and a strong inducement to do another PST adventure very soon. Peter Sommer runs a a highly professional organization. From his brochure to drop off at the airport to fly home his attention to detail and his consideration for his clients is superb. The archaeologists he uses as guides are erudite but highly personable and have an ability to turn a pile of stones into a recreation of the lives of the people who lived there over two millennia ago. Excellent. This was our fourth trip with Peter Sommer Travels and it lived up to our very high expectations. It was a wonderfully organized trip with beautiful cruising and swimming spots, great hikes, and fascinating lectures on the region and history. The ship was beautiful, comfortable, and excellently crewed. The guide was wonderfully informed and participated enthusiastically in all the activities. A shout-out also to the local guides who each brought their own perspective. Excellent. Boat was immaculate. All of the staff were professional and very nice. On board archaeologist was very organized and always there for us if we had any questions. We always felt safe, well taken care of with a very friendly attitude from crew while they showed us a great time, both fun and educational. Second time cruising with Peter Sommer Travels and we will definitely do it again. Excellent. A superb week exploring Rome. This was my first visit to Rome, and it was wonderful. We had a tour manager, an expert guide and a local guide to take us round & show us the sites. The hotel was excellent, full of character, quiet & secluded. The itinerary was a great mix - awe-inspiring Imperial sites, and some more recent buildings, all presented in context with details of their long stories, some truly superb museums, and some more day-to-day places, such as Ostia, all drawn together to provide a fascinating mosaic of Rome. We visited good restaurants, where we were guided & encouraged to sample local specialities. There was free time for us to see some essential sites independently, and there was guidance on how to use the free time we had. All in all a great week. 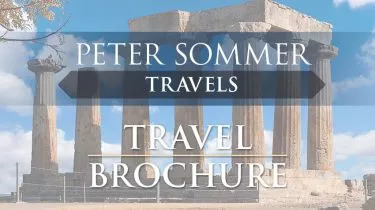 Peter Sommer Travel are a provider who take small groups on holidays that are primarily based on seeing archaeology, but also look to ensure that you enjoy a place as much as possible: you always stay in hotels with character, and eat the finest of local foods. I have now taken 14 holidays with them.